What do they say about the time required for the last 5% of a job? Well, I’m in the thick of it. Both decks are on. Hatches are glassed inside and out (I feared stepping through the stripped maple). 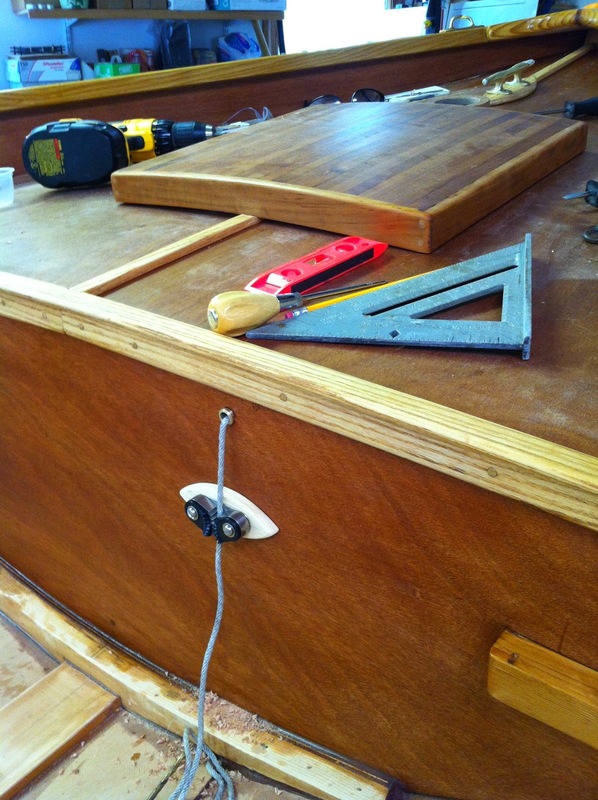 In order to hide a lot of the hardware associated with the hatches, piano hinges are installed and a pull string secures the hatch through a grommet manufactured from a brass hose barb cut and chamfered. I prefer hardware store items over pricey boat store items. 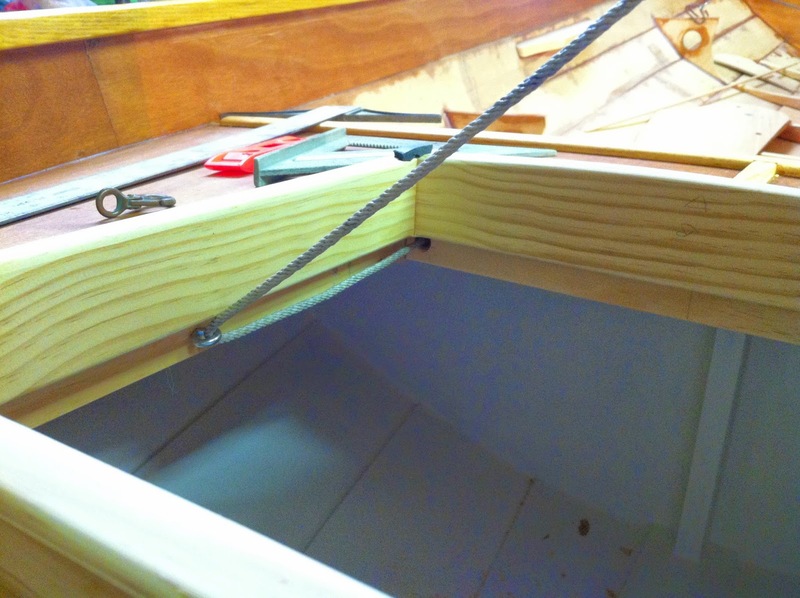 Aft hatch and deck with secure line with cam cleat. Gasket will be installed to underside of hatch. Lashing line lead through eye and hole in bulkhead. 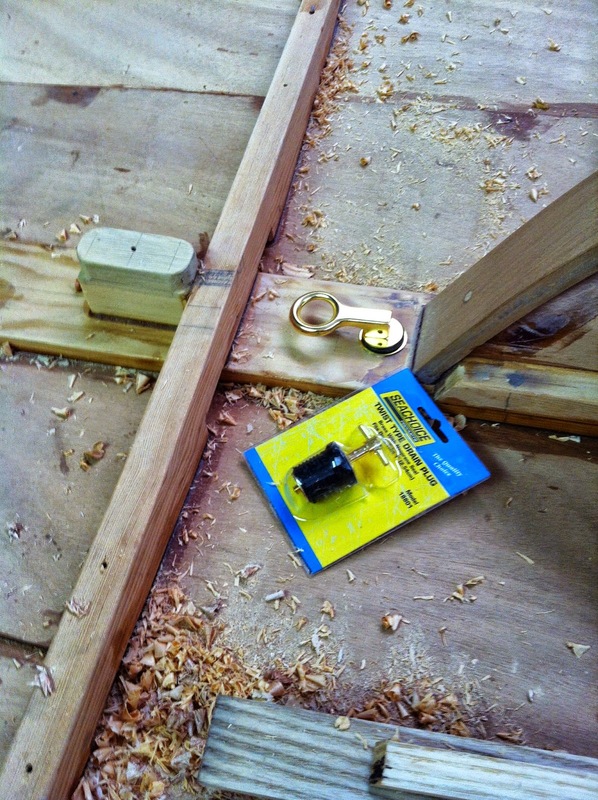 The mizzen mast deck collar and cleat bases are epoxied in place. The bases are echoes of the double ender. Cleat base and collar before epoxy. 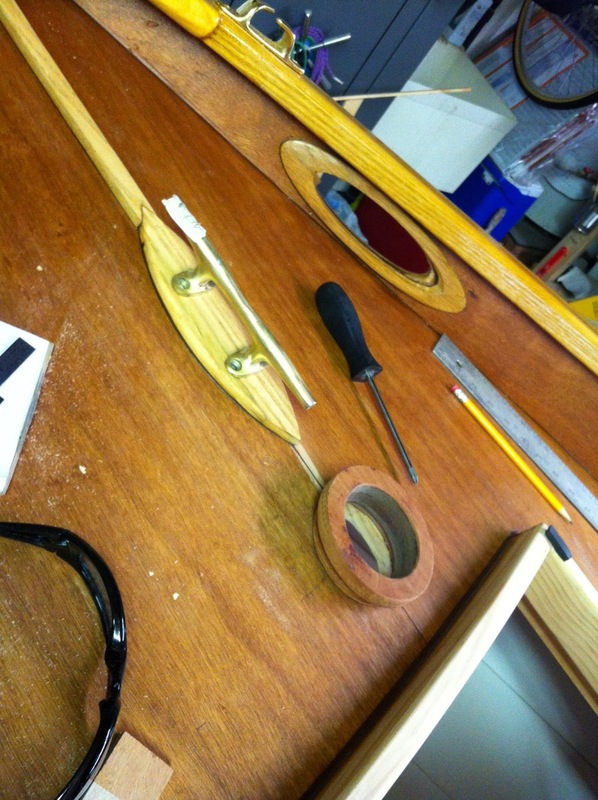 Main mast partners and foredeck coaming are now screwed and glued. 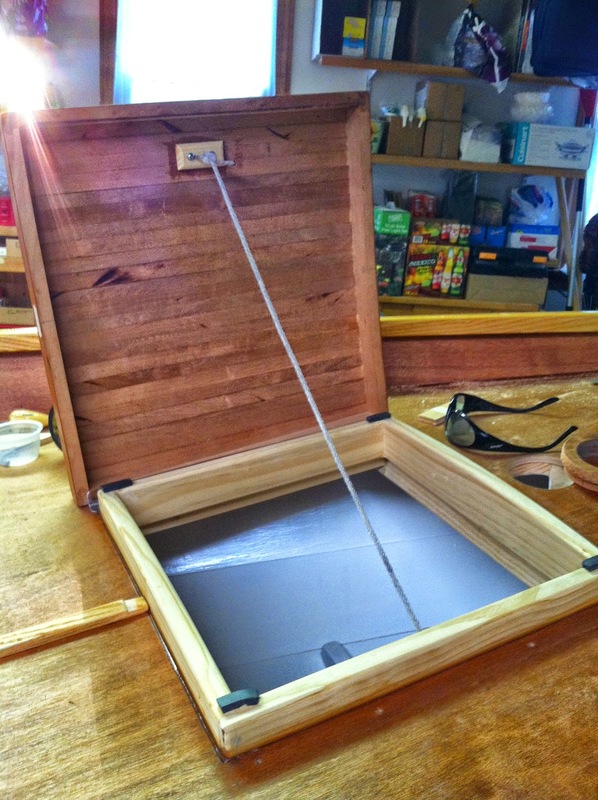 Hatch with epoxy glass shine. A 1″ drain is now in the bottom of the boat. This will aid in clean up after those future trips. A brass tube is epoxied through the bottom. Two different plugs were purchased. One is a compression lever. The other is a screw fitting. One will serve as a spare. 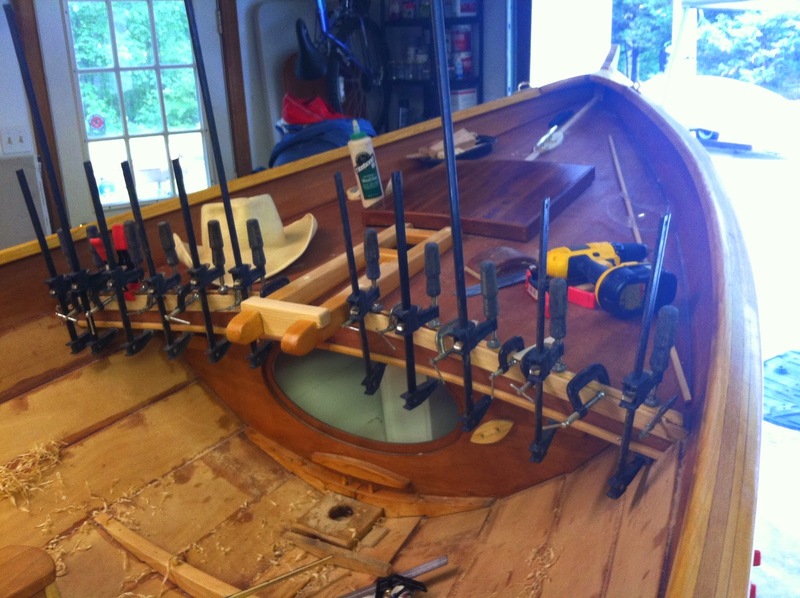 With the arrival of the sails from Douglas Fowler, the subtleties of spar bee holes, thumb cleats, and jamb cleats can be addressed. A centerboard and a few shear knees are all that remain to be manufactured. … the beat goes on. Looking great Edddie! You'll be in the water this year for sure at this rate. Hope it's soon Barry. Been in ME gawking at some beautiful wooden boats. Ready to have one myself. 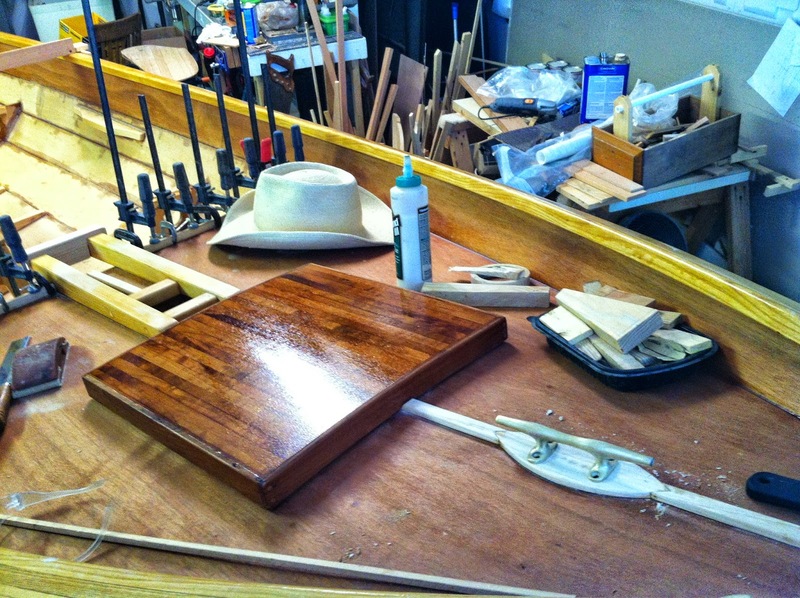 Toured the Wooden Boat School and Brooklin Boat Yard. Real nice!